In early October, Posadas, in Misiones Province, northern Argentina, played host to the IUFRO (International Union of Forest Research Organisations) conference ‘Adaptive Management for Forested Landscapes in transformation’. In addition to a specific session on Agroforestry, the integration of trees and farming featured many times throughout the conference programme as an approach to managing forested landscapes while maintaining their functions, including a keynote speech from Dr Florencia Montagnini from Yale University, leading light in research into the biodiversity benefits of agroforestry. The Agroforestry session, organised by AFINET partners and EURAF members Jo Smith (ORC), Anastasia Pantera (TEI), Gerardo Moreno (UNEX) and João Palma (ISA), and chaired on the day by Jo and Anastasia, provided a tour of agroforestry systems from Greece to Russia to Cuba to Argentina. We heard about how the general public in seven European countries preferred agroforestry landscapes, how tree establishment of native tree species was more successful in Argentinian silvopastoral systems than in forest plantation due to a higher degree of care from the farmers, and how agroforestry, as part of an agroecological approach, could increase resilience against hurricanes in the Caribbean. Anastasia gave an excellent presentation on participatory agroforestry research in Greece as part of the Agforward project, finishing with the key observation that agroforestry research is all about cooperation, both between different scientific disciplines and between farmers and researchers. That’s probably why it’s such fun! 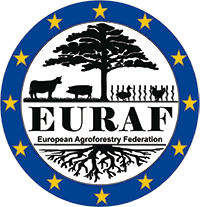 The session allowed participants to exchange experiences on agroforestry research from different countries, climates and continents and Jo Smith highlighted the opportunities for furthering this exchange at next year’s World Agroforestry Congress in Montpellier as well as through EURAF. Jo also outlined the AFINET project and encouraged participants to upload and search the AFINET Knowledge Cloud. The Province of Misiones provided an excellent illustration of the many complex factors impacting natural forests such as the region’s highly diverse Atlantic forest where deforestation has made way for soybean cultivation and livestock production. There are, however, many efforts underway to recover and conserve the Atlantic forest, ranging from top-down regulation by the Government’s Forest Act, through to Payment for Ecosystem Services schemes that reward farmers for undertaking sustainable management practices. One such scheme provided payments for silvopastoral farmers managing their forests sustainably, with payment rates being based on the conservation status of the forest linked to the carbon storage associated with those forests. Another scheme that we visited during the fieldtrip was rewarding farmers for using soil conservation methods, including riparian buffers, to improve water quality in streams and rivers that provide drinking water to the nearby city. While these schemes often only provided only marginal income relative to annual cash flows, they appeared to be critical as incentives to adopt conservation practices. Overall, the conference was a great opportunity to hear about the different pressures on forested landscapes, and how a diverse range of approaches, including agroforestry, can be used to ensure the conservation of these landscapes while maintaining their functional values for their human populations. We would like to thank Sandra Luque (IRSTEA) for inviting us to organise a session on agroforestry, and conference organisers Jose Gobbi (INTA) and Analía Pugener (Universidad Nacional de La Pampa) for their support and hospitality.